Creating a Propeller - Zen Toolworks, Inc. In this post, I wanted to demonstrate how to manufacture a part with a design on both the top and bottom of the piece. I decided to make a propeller because it is easy to design and might be useful for future projects. First sketch the shape of the wings of the propellers. I used three lines and a 3-Point Arc to make the outline. Make sure that the blade is the correct length. After sketching the blade, press Q and extrude it. I made my blades 3mm thick, so that they would be strong enough to survive minor impacts. Duplicate one of the blades and then rotated the copy so that it’s center point is 180 degrees. Move it so that there is enough room between the blades to connect a dowel to it. After the blades were created and in the correct spot, I rotated each blade 20 degrees in opposite directions, so that there could be lift when the blade spins. I then sketched the center of my propeller. I drew lines along the edges of fins so that I could use midpoint constraints to find the center of the part. In the center of my part, I made a circle that would create a hub to connect the fins, and then made a hole in the middle of the propeller so that I could attach a 3/8″ dowel. Press Q and extrude the outer circle. Choose Join as the Operation and Symmetric as the Direction. This will complete the design. To begin, I like to set the origin to the front left corner of the material. Make sure that it is oriented correctly. Move to the Stock tab and fill out the size of the stock. Put the design on the bottom of your stock to make sure that you can cut all of the way through the material with a contour cut, and in the middle of the x and y directions. Go to the Setup tab and select the origin of the design as one of the corners of the stock box. I prefer to use the front left corner, since it is easy to zero out the origin with the machine. In the Tool tab, check that the tool is the correct bit. I chose to use a 1/8″ ballnose endmill, since it will be able to cut through the material quickly and be fairly accurate when roughing out the pockets. In the Geometry tab, set the Machining Boundary to Silhouette. Set the Tool Containment to Tool on boundary. In the Passes tab, I set the Maximum Roughing Stepdown to 0.75 mm. Also, check the box next to Stock to Leave and set both of the values that appear to 0.5 mm. In the Tool tab, I selected the bit to be a 1/8″ endmill. In the Geometry tab, set the Machining Boundary to Silhouette. Set the Tool Containment to Tool outside boundary. In the Passes tab, I checked the Multiple Depths box and changed the Maximum Roughing Stepdown to 0.25 mm in order to reduce the stress on the fins as the are being contoured out. In the Passes tab, I changed the pitch to 0.25 mm so that the part would not break from the stress. In the Passes tab, check the box for Add Perpendicular Passes and changed the Stepover to 0.25 mm. Both of these changes will lead to a much smoother finish. After you have made all of the necessary paths, duplicate the entire set up so that you can carve out the bottom. Edit the new setup so that new origin is at the correct point and in the correct alignment. After I made the new set up, I flipped over the piece just like I would in real life in order to see where the to place the new origin and how it should be oriented. 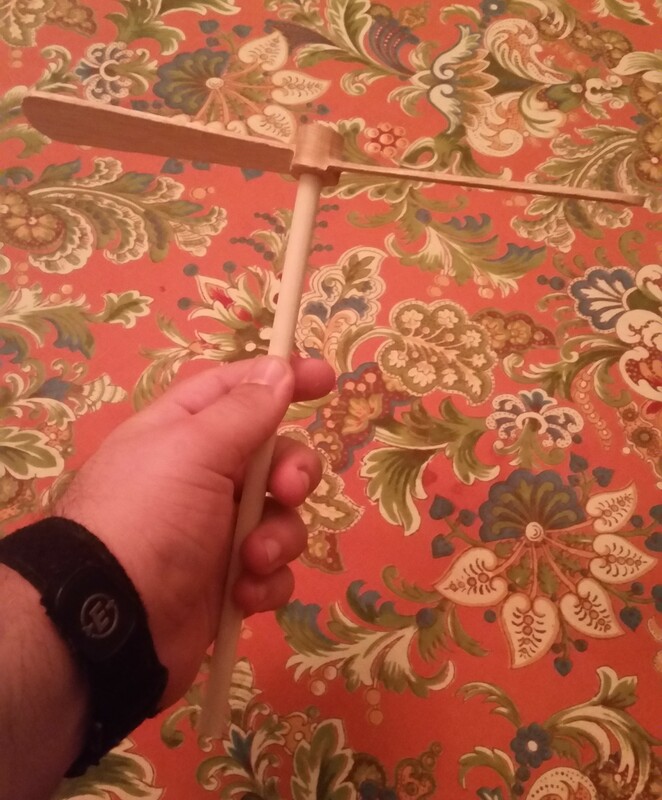 I added a 3/8″ dowel to the propeller to see if I could generate some lift. The most important lesson I learned when making this project was that the only reliable way to cut the holes in the stock is by using cnc. I tried to drill holes in the stock hand drill in order for it to bolt the stock down, the final product ended up having the different side offset from each other by a full millimeter. I hope this was blog helpful. Look out for my next post when I expand this project. What program did you use to draw the part? I used Autodesk Fuision 360 for the entirety of this project. It is really convenient because it has all of the functionality you need to create a piece from design to CAM.